I was able to create jotforms that get sent to a file on Dropbox, but the file's subfiles look like randomized numbers. I would like to organize them so I can have my students submit their homework via the form and have specific folders created for each student. Help! Can't get a screen shot uploaded because you won't take a PDF. 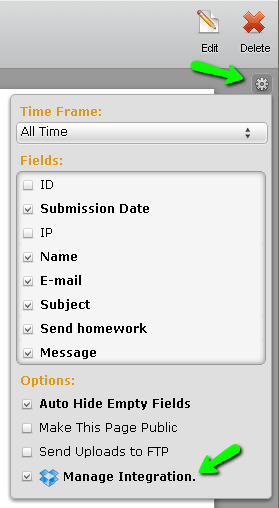 Now, each time one of your students submits an assignment, it will be placed in the folder bearing their name. 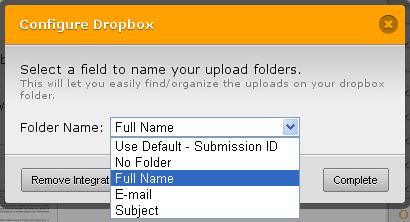 The first time a student submits a file, their folder will be created and thereafter all files submitted by that student will be uploaded to that folder. In Step 5 above, if the "Full Name" field had a different label (like just "Name", for instance), you would choose that from the dropdown menu. If you need additional assistance with this or anything else related to our product, please let us know. We'll be glad to help you.